Now that we have an understanding of the note names we need to put that into practice on the guitar fretboard. It is important for a guitarist to be able to name the notes on the fretboard. This is the method that I use and teach. First of all we need to be able to name the notes on the 6th and 5th strings and then we can use patterns of octaves to name other the notes on the guitar. The sixth string is the lowest sounding and usually thickest string closest to the top of the fretboard and the fifth is the next string down. I use the 3rd, 5th, 7th, and 10th, frets as reference points. The 3rd, 5th, and 7th, because they are natural notes and the frets have dots on them usually and the 10th as it is a natural note. 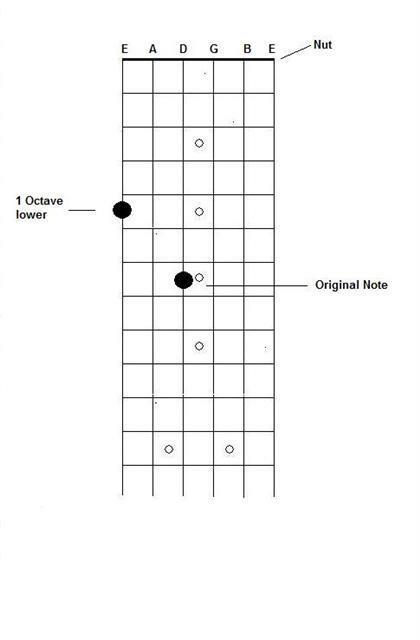 Remember, the 12th fret is the same note as the open string but one octave higher. Here are the notes. You will have to learn these. There are no shortcuts. You may find it helps to work in pairs to learn these notes. For example the notes on the third fret are G on the 6th string and C on the 5th string. So 3rd fret = G and C. 5th fret = A and D etc. Once you have these notes learned we can fill in the gaps between the whole notes. For example if we need to know the note for the third fret on the E string we know from the diagram above that this is a G. If we need to know the note on the fourth fret on the E String we can start at the nearest natural note which is either G or A and work up or down to the note. Working up from G using the knowledge from the previous lesson you can see that we have sharpened the note so the note on the fourth fret is a G#. Working down from the A at the fifth fret will give us the answer Ab. We already know that G# and Ab are the same note. We will find out when to use sharp or flat notes in a later lesson. Be careful to remember that the notes E and F, and B and C have no sharp or flat notes in between them. 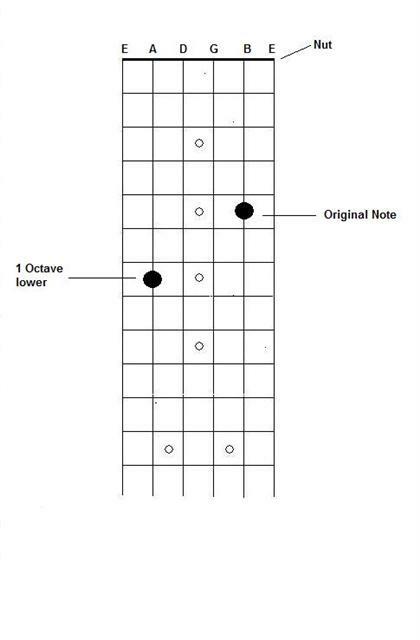 Therefore the 8th fret on the E(6th) string is the note C and the 8th fret on the A(5th) string is the note F.
We should know be able to name the notes on three strings on the guitar with a little bit of thought. Why three? Both the 1st and the 6th strings are tuned to E, so if we know the 6th we know the 1st. Cool eh. To find the notes on the remaining strings we will use octave shapes to work back to the the 5th and 6th strings as we now know the notes on these two strings. If we pick any note on the D string, for example the 7th fret. We should now be on the fifth fret on the E String. The note we are now on is one octave lower than the note we started on, so we know the original note was also an A. We should now be on the fifth fret on the A String. 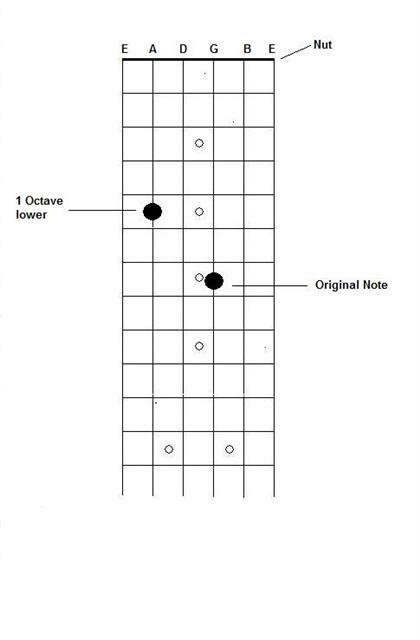 Again, the note we are on is one octave lower than the original note so we know the original note is also a D.
We should now be on the 7th fret on the A String. Remember – The first string is tuned to E so is the same as the sixth string. Happy days. You should now be able to name any note on the guitar. It takes time and you get quicker at it, trust me. Eventually you may find you don’t have to use this method as you get to know the notes. 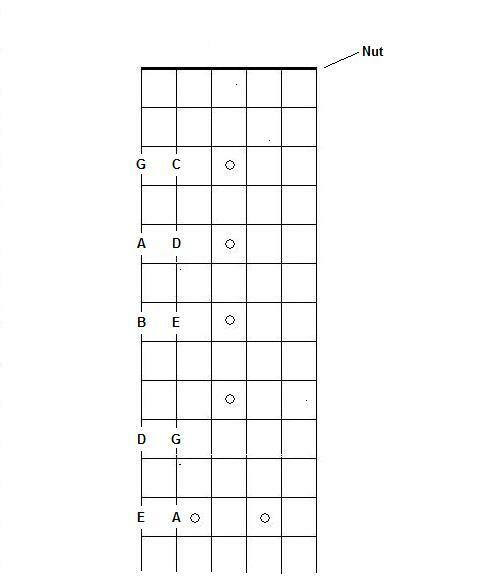 To practice this just pick any note on the guitar and name it. You could try naming every note on every string on individual frets as well for example name every note on the 5th fret. Have fun.